Harmless pyrotechnic ruse nullifies opponent's Tactic card unless opponent has an OFFICER with CUNNING > 8 aboard a ship or facility in this battle. This Card-Review article was written by Evan Lorentz and was published first on "Decipher's Website (decipher.com)" at Aug 11th, 1999. This Tactic should prove attractive to both offensive and defensive battle side decks. 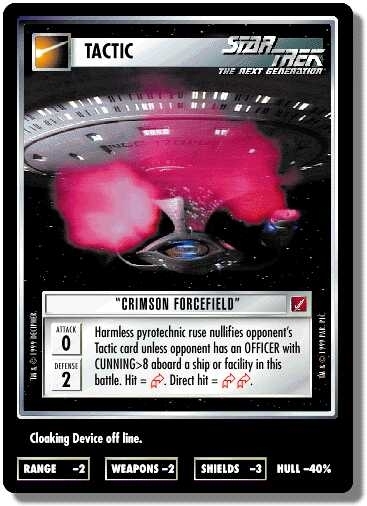 On the defense, "Crimson Forcefield" will nullify your opponent's current Tactic card unless they've got a high CUNNING OFFICER leading the attack -- no special game text or modifiers to use against you. On the offense, some copies of these sprinkled throughout your deck will make for some very serious damage results against your opponent: reductions of at least two to all three ship attributes, disabling of any Cloaking Devices, and a massive hull reduction of -40%. "Crimson Forcefield" + Brain Drain: If your opponent moves in their ships to attack you, Brain Drain their high CUNNING OFFICERs before they can initiate the battle. Maybe you won't actually draw the Forcefield when it comes down to drawing Tactics... but then, maybe the bluff alone will be enough to discourage the attack! Or "Crimson Forcefield" + Battle Bridge Door (or Attack Pattern Delta): Increase your chances of drawing that big, defensive Tactic.